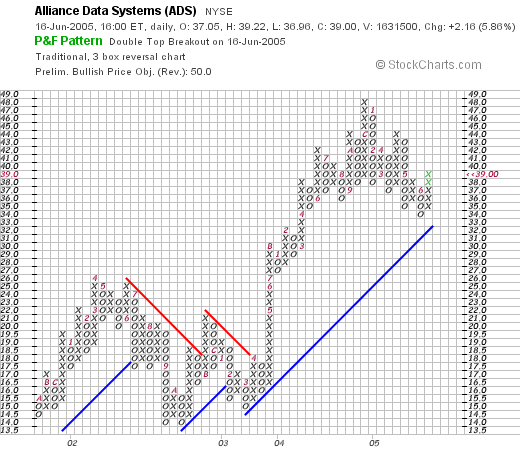 Earlier today, I purchased some Alliance Data Systems stock (ADS) for my trading account, and I wanted to briefly go over my thinking. It is very late here and I want to get right to the point....so bear with me. ADS made the list of top % gainers on the NYSE today, closing at $39.00, up $2.16 or 5.86% on the day. I purchased some shares this afternoon, after selling shares of HIBB that had hit a 300% gain mark (!). Yahoo "Profile": The company "...provides transaction services, credit services, and marketing services in North America." 1st quarter 2005 earnings: Revenues rose 20% to $375.9 million from $312 million. Earnings jumped to $37.2 million or $.43/share from $32.3 million or $.39/share last year. "5-Yr Restated" financials from Morningstar.com: Revenue has grown steadily from $0.7 billion in 2000 to $1.3 billion in the trailing twelve months (TTM). Earnings have climbed from $.31/share in 2002 to $1.26/share in the TTM. Free cash flow looks nice with $80 million reported in 2002, expanding to $345 million in the TTM. Balance sheet is o.k. with $156.7 million in cash and $461.9 million in other current assets, enough to cover the $485.1 million in current liabilities, but not enough to cover all of the $778.2 million in long-term liabilities as well. Yahoo "Key Statistics": Large cap stock with a market cap of $3.25 Billion. Trailing p/e moderate at 30.81, but the forward p/e is much nicer (fye 31-Dec-06) at 17.89; thus, the PEG comes in at 1.14. The Price/Sales ratio is 2.32. This doesn't look bad in the context of the "Information/Delivery Svcs" industry. Jupitermedia (JUPM) is at 7.6, FactSet (FDS) at 5.5, ADS at 2.5, Proquest at 2.0 and DST (DST) at 1.6. Other statistics: 83.37 million shares outstanding with 68.87 million of them that float. Of these, as of 5/10/05, there were 2.35 million shares out short, representing 2.90% of the float or 2.5 trading days of volume. No cash dividend and no stock dividends are reported. After moving sideways from 2002 through 2003, this price chart broke through resistance in April, 2003, at $18, and has moved strongly higher since. The chart looks nice to me. So what do I think? Well, I liked it enough to buy some shares! The latest quarter was strong, the last five years look nice, with growing free cash flow. The balance sheet is adequate, and valuation looks reasonable. Finally, the stock chart looks nice as well. Thanks again for visiting. If you have any questions or comments, please feel free to leave them right on the blog or email me at bobsadviceforstocks@lycos.com. Hello Friends! Thanks so much for stopping by and visiting my blog, Stock Picks Bob's Advice. As I always point out, and I mean it, I am truly an amateur investor, so PLEASE consult with your professional investment advisors prior to acting on any information on this website! Earlier today, my Coach Stock (COH) which has been a fabulous investment, hit one of my sale points. If you are new to what I write, I believe in selling losers quickly at an 8% loss, and selling winners slowly at different sale points on gains. In other words, I sell 1/4 of my remaining position at gains of 30, 60, 90, 120, 180, 240, and 300% gain levels! After that, I shall sell at 360%, then by 90% increments x 4 etc. Anyhow, I actually hit TWO 300% gain points today. First, my Coach stock hit 300%, and I sold 1/4 of my position. Then my Hibbett also hit 300% (!) and I sold 1/4 of my remaining shares. Unfortunately, since I purchased these stocks a couple of years ago, my initial purchase was not as big as my current buys. Nevertheless, this gave me "permission" to add two new positions, actually filling my "quota" of 25 positions in my trading account. Hopefully, the market continues relatively strong, and I can start applying my partial sales to paying off my neverending margin :). Back to the sale. So sellling a portion of Coach entitled me to add position # 24. Looking through the list of top % gainers on the NASDAQ today, I came across Progress Software (PRGS) which closed at $30.33, up $2.13 or 7.55% on the day. Actually, as the market turned around and moved higher late in the afternoon, PRGS was no longer on the top 50 gainers, but my purchase of 240 shares at $30.96, was already made :). According to the Yahoo "Profile" on PRGS, the company "...engages in the development, marketing and distribution of software and services for the development, deployment, integration, and management of business applications deployed in a distributed, Web-based or client/server environment." What drove the stock higher today was the 2nd quarter 2005 earnings announcement this morning. PRGS reported that revenue climbed 10% to $100.2 million from $90.8 million last year, and net income rose 54% to $14.4 million or $.35/share from $9.4 million or $.24/share for the same quarter last year. Looking at the "5-Yr Restated" financials from Morningstar.com, we can see that while revenue dropped from $273.1 million in 2000 to $263.6 million in 2001, it has climbed steadily since with $374.0 million in the trailing twelve months (TTM). Earnings also dropped from $.85 in 2000 to $.46/share in 2001, but since 2001 have climbed steadily to $.93/share in the TTM. Free cash flow the last few years has grown steadily from $38 million in 2002 to $62 million in the TTM. The balance sheet also looks solid with $204.7 million in cash, more than enough to cover both the $178.2 million in current liabilities and the $8.8 million in long-term liabilities. In addition, Morningstar reports that Progress has an additional $95.4 million in other current assets. Looking at "Key Statistics" from Yahoo on Progress, we can see that the market cap is at $1.13 billion making this a mid-cap stock. The trailing p/e is a bit rich at 32.33, but the forward p/e (fye 30-Nov-06) is a bit better at 21.36, and estimates suggest a PEG of 1.51, making this not exactly a bargain, but not that expensive either. 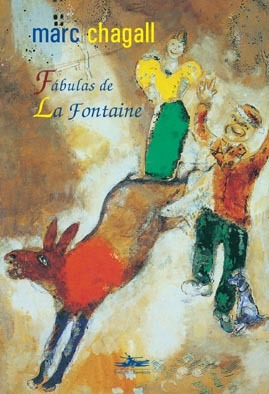 This is a Poster by Marc Chagall, another of my favorite artists! Yahoo shows the Price/Sales ratio at 2.81. Using this measurement of valuation, with data from the Fidelity website, we find that Progress is in the "Application Software" industry and its Price/Sales ratio is actually quite reasonable relative to other members of the same industry group. Microsoft (MSFT) tops the list with a Price/Sales of 7.0, Oracle (ORCL) next at 5.9, Veritas (VRTS) at 4.9, Cognos (COGN) at 3.8, and Siebel (SEBL) at 3.5. Progress is the cheapest with its 2.8 Price/Sales ratio. Going back to Yahoo, we can see that there are 37.23 million shares outstanding with 35.97 million of them that float. Of these, there were 1.07 million shares out short as of 5/10/05. This amounts to 3.00% of the float, or 4.3 trading days, making this somewhat significant using my arbitrary 3 day cut off on short interest ratios. Yahoo shows no cash dividend paid and the last stock split was a 2:1 split in January, 2000.
we can see that the stock was actually trading lower between late 2001 and into late 2002, when in October, 2002, it broke through resistance at $14, and has traded higher since. 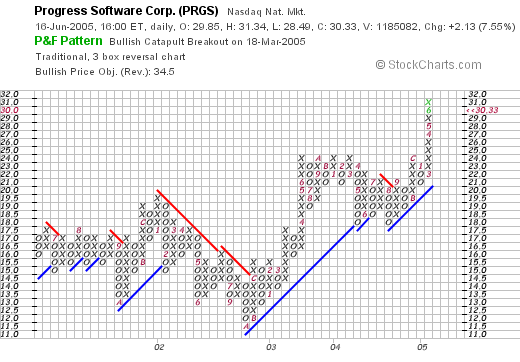 Recently, PRGS has shown significant strength moving rapidly higher. The stock looks bullish, and not really over-extended to me! So what do I think? Well, I liked it enough that I bought some shares earlier today. Reviewing: the stock moved strongly higher today on a very solid earnings report. The last four, if not five, years have been steadily growing earnings and revenue for PRGS. The free cash flow is positive and growing and the balance sheet is quite pretty. Valuation wise, the PEG is 1.5, but the Price/Sales at 2.8 is the lowest in its group. Finally, the chart looks great. Thanks again for stopping by! Your visits are appreciated by me and for those who stop to comment or email me a note, thanks again ahead of time! It makes it all worthwhile. If you have any questions or comments, please feel free to leave them here on the blog or email me at bobsadviceforstocks@lycos.com. Hello Friends! Well I hit 25 positions earlier today. Now I shall try to sit on my hands :). After selling my partial position in HIBB as I wrote up earlier, this was a signal to add a new position (being at 24, with a goal of 25). Scanning through the lists of top % gainers, and reviewing Morningstar.com, I came across Alliance Data Systems (ADS) that I do not believe I have reviewed here on Stock Picks....will try to get that in later or tomorrow as well. Anyhow, I bought 200 shares of ADS at $39.06, shortly before the close of trading. Wish me good luck! Anyway, with future sales, I shall be applying the proceeds to the margin balance, unless I drop down to 24 with a sale on bad news, in which case I will wait for a sale on "good" news, prior to going back to 25. I hope you follow. Will I ever get over 25? Well, never say never :). If I pay off my margin, I will be thinking about indications for adding a new position. Maybe THAT will be the trigger? Thanks so much for stopping by. I hope that my chatter is helpful to you. Remember that I truly am just an amateur investor who loves to write about stocks, so please consult with your investment advisors who are professionals! Hello Friends! Just a quick note to update you. Another of my stocks hit a sell point, Hibbett Sporting Goods (HIBB), which I first purchased 3/6/03 at a cost basis of $9.74, hit the 300% gain point as well, and I sold 1/4 of my 98 shares (24 shares) at $39.18 a few moments ago. That represents a gain of $29.44/share or 302.3%. WOW! Anyhow, I am now "entitled" to purchase position #25. Probably not enough time to go fishing this afternoon for a position, but I can feel that last nickel burning a hole in my pocket!